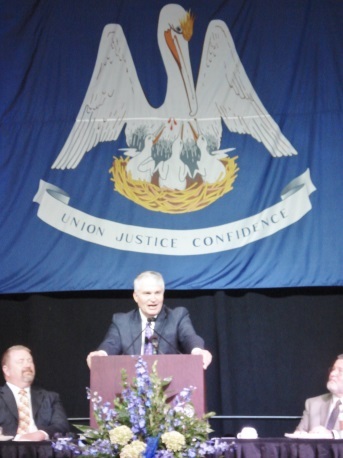 As part of my ministry with Grace Adventures, I am the Louisiana State Chaplain with the Capitol Commission. Here is a picture of the ministry team of Capitol Commission taken at our 2015 Annual Gathering at the Indianapolis, Indiana Capitol Building. Together we are impacting the lives in capitol communities across our nation. An atheist legislator continues to express appreciation for the printed devotionals distributed each week to all the state legislators. They have proved a great help and encouragement. In addition, a legislative-aide was impacted greatly by counsel received while dealing with a personal struggle resulting from emotional abuse by the spouse. “As iron sharpens iron, so a man sharpens the countenance of his friend” (Proverbs 27:17). Two individuals: a legislative staff member who attends the Bible study and a self-described agnostic state employee. By God’s grace after answering many questions, the state employee was led to Christ, baptized and discipled by our State Minister. Then the two were engaged and our State Minister provided extensive pre-marital counseling. Officiating at their wedding, our State Minister was asked to share the “Good News” of Jesus with everyone attending the wedding which included capitol leaders, staff members, state employees and lobbyists. “Through thick and thin, keep your hearts at attention, in adoration before Christ, your Master. Be ready to speak up and tell anyone who asks why you're living the way you are, and always with the utmost courtesy” (1 Peter 3:15-16). When the governor was diagnosed with cancer, state-wide prayer services for the governor and other state leaders were planned and participated in. The result: the governor was declared cancer free; many hearts were drawn closer to the Lord and closed minds were opened to the gospel. “Is anyone among you sick? Let him call for the elders of the church, and let them pray over him, anointing him with oil in the name of the Lord. And the prayer of faith will save the sick, and the Lord will raise him up” (James 5:14-15). It was a joy to be the speaker the 25th Annual Men’s Retreat of Forcey Bible Church. Our topic was FRIENDSHIP. We looked at the relationship of Jonathan and David, and David’s relationship with God. Jesus met us on the Mountain. My next Men’s Retreat is at The Villages in Florida February 23-24, 2016. Pray for all the upcoming speaking opportunities. They are posted at www.graceadventures.info. Pray also for our new website that is under construction. A short time ago I met with a person going through a crisis of faith. As the story unfolded they said in this order, "I don't know if I believe in God anymore. I'm not sure who I am or why I’m here. I've had a lot of problems. I don't know if Jesus is the Savior and wonder if all religions are equal. I don't know if heaven is real, or if this life is all there is. Can you help me with my crisis of faith?" The whisper of the Spirit let me know, "Clue-phone to Michael-This is an Open Door for the Gospel.” I asked permission to walk the person through the Epic Story of the ages and jotted down five words and explained biblically their significance: GOD (Does God exist? What is He like? ), CREATION (Who am I? What is my identity? ), STRUGGLE (What is wrong with the world? What is wrong with me? Who is the villain? ), RESCUE (What/Who is the solution? ), HOME (Where am I going? Is there any hope?). These five words rightly understood were the answers to the five issues raised earlier. Through the power of the Gospel this person trusted in Jesus Christ. It never gets old seeing someone become a new creation. Earlier this week I went through a whole day of appointments and repeatedly got to share the Good News. In the early evening a new disciple called saying he had the opportunity to share the gospel with a friend that day. Hearing that the baton is passed to another who is discovering opportunity is just as inspiring to me as if I had shared it myself. We pray and yearn for a transformation of hearts and a revolution of minds in Caesar's household and Capitol Communities through the person of Jesus Christ and the power of the Word of God. The harvest is plentiful. The opportunities overflow. By God's grace the best opportunities are still ahead. 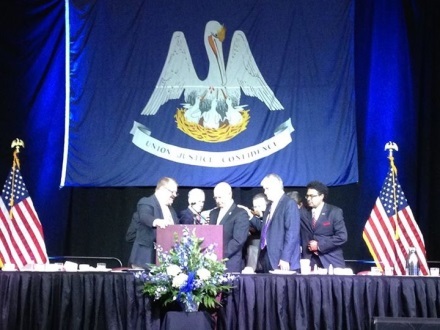 It is a joy to serve as the Chaplain to the State of Louisiana with the Capitol Commission. In September I had the privilege of joining with Chaplains from many of the other states across the nation in the Indiana State Capitol for an annual gathering. The Capitol Commission is an outstanding organization. You can discover more about this National Ministry at www.capitolcom.org. Here’s what a couple of leaders are saying about our ministry. 1. Pray for the Forcey Bible Church Men’s Retreat in Maryland at the end of the month. 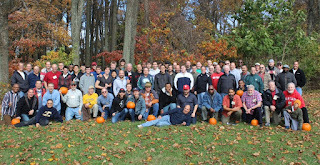 I will be speaking to over one hundred men over the weekend at their 25th Annual Men’s Retreat. 2. Pray for the Leadership St. Tammany Revisited Program I am chairing that will address the issue of disengagement and engagement in civic life and responsibility. We have a great line up of speakers at this half day event. 3. Pray for Bible studies, one-on-one appointments and speaking opportunities this month. I had the opportunity to speak at the National Convention for the Christian Legal Society this past weekend. 4. Pray for elected leaders and those running for office (2 Timothy 2:1-4). 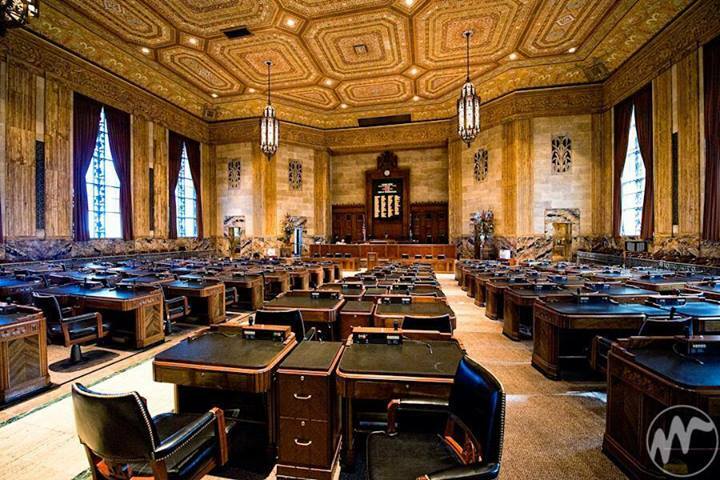 Our elections are this month in Louisiana and that means leaders need to depend on the Lord and look to Him. 5. Pray for our grandson, who is now 2.5 pounds and due to make his grand appearance in December. The doctor says all looks great. 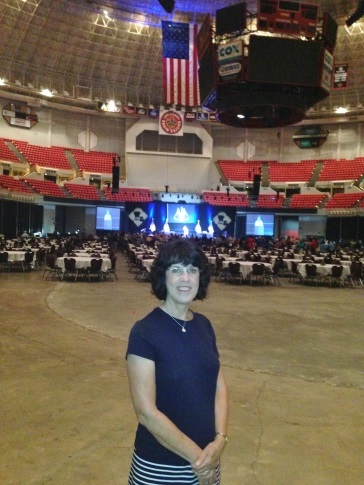 On July 31st I had the honor of being the keynote speaker at the Louisiana Municipal Convention prayer breakfast at the Ragin' Cajun Dome in Lafayette, Louisiana. Over 500 were in attendance, including a roomful of mayors and elected leaders serving throughout the state. I spoke on the topic “Is There Hope for America?” A huge number indicated they want to know more about our Leader Faith Forums! Opened the door of my heart for Jesus to enter. Too often I do not feel there is any hope, but indeed, through Jesus we can always have hope. Made me think through things I have been struggling with for a while. Your message encouraged me to press on and stay encouraged. I've been praying for God's light to be shined upon our elected leaders. Inspiring for me to hear the Word of the Lord in a political venue which is much needed. I want to be involved in a Leader Faith Forum. Adding you and your ministry to my prayer list and ask you to add me and my town to yours. 1. Pray for a revitalization in Louisiana and America. With Jesus there is always HOPE!!!! 2. The mayor being prayed over in this picture is the Mayor of Lafayette, Louisiana where the tragic Movie Theater Shooting had just occurred the week before. The theater, which was right around the corner from the Cajun Dome, was still closed while we were there. Much prayer is needed for the people. 3. I have over 100 Mayors and leaders to follow up with who want to know more about getting into a Leader Faith Forum. 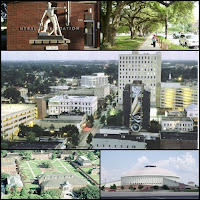 Two months prior to this event I was praying and asking the Lord how these forums might spread to interested leaders across the four corners of the state of Louisiana. 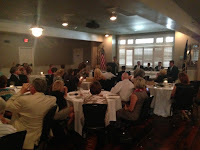 It was within days I got the call to speak to the 305 Mayors of the state. There was my OPEN DOOR. Even I couldn’t miss this one. Thank you for praying!! 4. Pray for many upcoming speaking opportunities in the community . . . retreat, Leader Faith Forums, Leadership St. Tammany, Christian Legal Society, etc. 5. Pray for wisdom in exploring preaching opportunities in churches. I find many people are disenchanted and even discouraged with the condition of our nation and communities. Encouragement and vision is needed about where our hope rests and understanding the Kingdom is not dependent upon the cooperation of Caesar. 6. 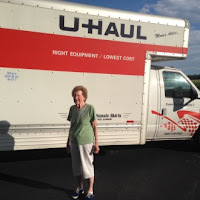 I helped move my mom back to Maryland to live near my brother. It will be a new adjustment but it is great having mom closer to her kids. 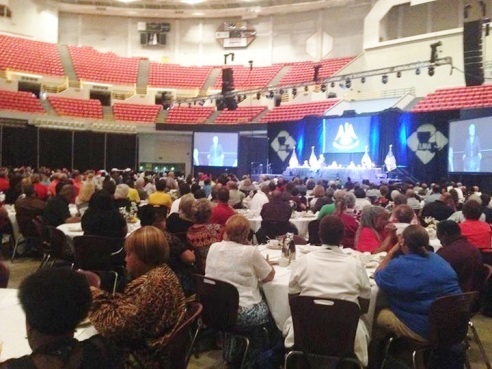 I am asking for prayer for the opportunity to be the keynote speaker at the Louisiana Mayors Convention Prayer Breakfast in Lafayette, Louisiana on July 31st. 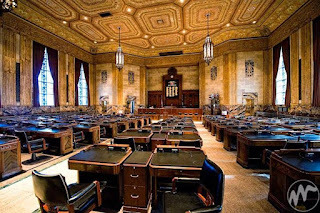 I will have the opportunity to speak to 305 Louisiana Mayors and will be sharing the ministry of the Capitol Commission and the good news of the Gospel. I will invite the Mayors to let us help them start Leader Faith Forums in their Parish like we have on the Northshore and Southshore of New Orleans. They are expecting 500-800 leaders in attendance. Reaching leaders helps reach communities. Please pray as we attempt great things for God and expect great things from God. May Jesus be lifted up and God glorified. Imagine Parish Presidents, Judges, Mayors, Legislators, Political Chiefs of Staff, Councilmen and women, Police Chiefs, Fire Chiefs, District Attorneys, Coroners, etc. coming together all over Louisiana to seek the face of God and to ask Him to heal our land. Last Sunday July 5th, I had the honor of preaching at First Baptist Covington on the topic of “Is There Hope for America?” Many are discouraged about the direction of our land and need to be encouraged that with Jesus there is always hope. God did not make a mistake planting us sovereignly in this our generation and this hour so that we can participate in His Great Commission. These are great days to be alive and share the hope that is within us. The challenges are great but God is greater. 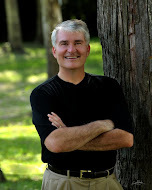 will lead a couple of workshops at the National Convention of the Christian Legal Society in New Orleans, and will speak at the Staff Gathering of the Capitol Commission at the Capitol in Indianapolis, Indiana. I hope to do more preaching in churches, church groups and community groups and share our work with the political community as well as the hope we have for these challenging times. If your church or group would be interested…let me know. These things seem to work best by word of mouth to discover open doors. It is a deep honor to walk the halls of the Capitol weekly during Session and take a seat in the House Chamber to pray for and interact with leaders in the Capitol Community. The House of Representatives Bible Study and the two Lobbyist/Administration Studies have gone well. One-on-one time with leaders is fruitful. I serve wanting nothing in return and regardless of politics. I simply want all leaders to know Jesus and take a next step in their faith. If you reach leaders, you can reach communities and even nations. I have been asked to be the Keynote speaker at the Prayer Breakfast for the 305 Louisiana Mayors and guests at their three-day convention in Lafayette on July 31 at 8am. 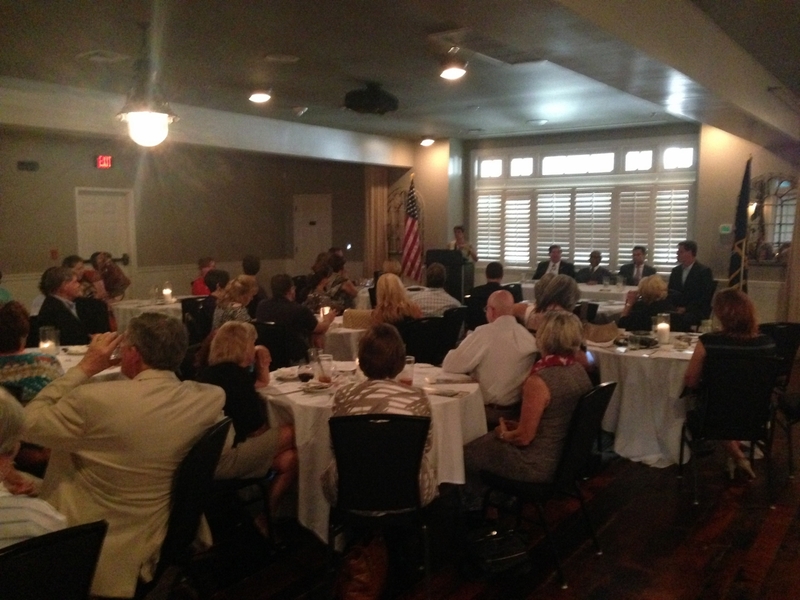 Our Leader Faith Forums for Parish elected leaders on the Northshore and the Southshore have gone extremely well. Potentially this monthly type of gathering could serve elected leaders in communities around the state. I have been asking God how we could get the word out statewide. Answer … this invitation to speak to the 305 mayors of the state. Pray. Pray. Pray. 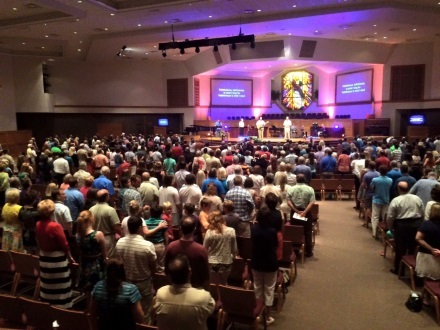 Pray for open doors with leaders statewide. In May I had the opportunity to preach at and provide mid-week training for an entire church that recognized a need to prepare their people in sharing the good news of the gospel. I was so impressed with the eagerness of these people to be equipped and sharpened. Churches are often quick to ask for teaching on finding the will of God, finances, romance, or family but very few churches want training on sharing the Gospel with role-playing included. It was a delight, and I know fruit will come. I love providing this training. If your church, para-church, retreat or group would be interested in this equipping, please let me know. Pass the word for me. While John Paton was a university student in Scotland, God called him to missionary work in the New Hebrides. After graduation he and his bride sailed to the southwest Pacific and began work with the savage cannibals on the island of Tanna. His wife and infant son died a few months later, and Paton slept on their graves for several nights to prevent the cannibals from digging up the bodies and eating them. After almost four years of faithful service, he left without seeing a single convert. Many years later his son by another marriage resumed the work in Tanna and eventually saw the entire island of people come to Christ. When the elder Paton revisited the island, the chief of the former cannibals asked the missionary who the great army was that surrounded his hut every night when he first arrived. God’s angels had protected him. Because of his faithful work and that of his son, when he left New Hebrides for the last time, it is reported that he said with tearful eyes, “I don’t know of one native on these islands who has not made a profession of faith in Jesus Christ.” This is my prayer for today!!! !